In June 2017, a group of students and teachers from Lingfield College travelled to Matugama, just south of Colombo. They flew overnight to Colombo from Heathrow, and then spent two weeks working on a Care & Community project together. I worked with the group as their Volunteer Coordinator in Sri Lanka, and here’s a breakdown of what they got up to. 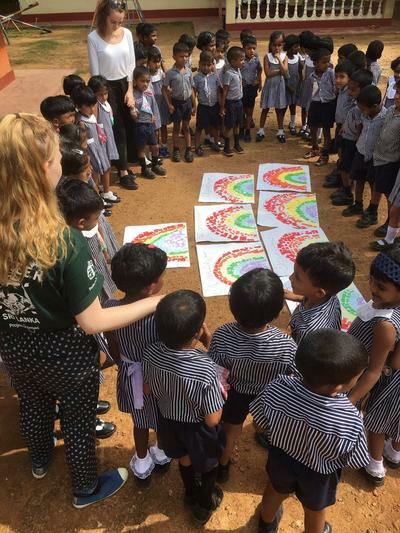 During the mornings, the group would split into five smaller teams and travel to a number of local preschools to help develop the children’s basic English; their topics ranged from road safety, to animals, to colours of the rainbow and much more. Arts and crafts proved very popular, but there were also songs and games, sensory activities and sports. In the afternoons, the group would split in half; one half would travel to a special needs school, where they undertook the task of painting a 100m long wall around the edge of the school grounds. 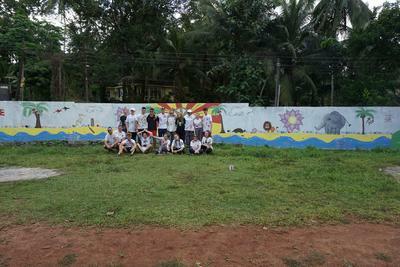 The group painted three different murals, all of which were very well-received by the children and staff at the school. There was a beach scene, a woodland fresco and a section on politeness and manners as requested by the school. The other half of the group would run more advanced English lessons with local adults, teaching them situational vocabulary, grammar and tenses. The students would plan their activities each evening, making sure they had all their resources prepared for their lessons the following day. 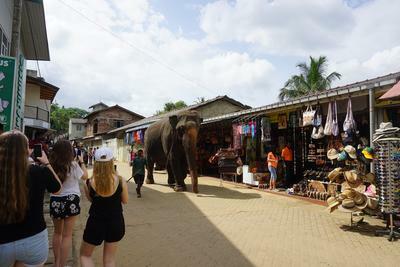 The group had two weekends off over the course of their trip, and the first was spent in Kandy. 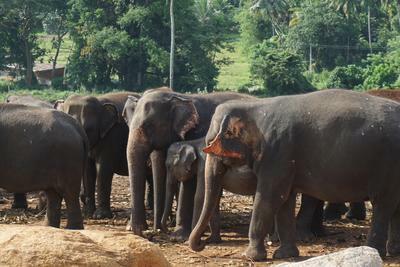 The first day saw them stopping en route to Kandy for a visit to Pinawella Elephant orphanage for an up-close encounter with rescued elephants. The rest of the weekend was spent shopping in one of the town’s markets, watching a traditional Kandyan dance show, exploring the world famous Temple of the Tooth, delving into the strange world of Helga’s Folly and more. Their second weekend was split between the colonial town of Galle to the south, where the group explored the old fort and spent the afternoon relaxing and swimming at a hotel by the beach, and a tour of the capital, Colombo. “Projects Abroad in particular were outstanding. We were welcomed and looked after throughout the whole trip. We were allocated two trip advisors; Bessie and Amir. They were informative and helpful in terms of both culture and cards games hence how they became very much part the group. At no point was there an unorganised half hour without laughs, or curry for that matter! It was great to see the change in the group, even across a short space of time. Many of those who started out nervous and unsure of themselves on the first day were soon throwing themselves into every activity with the utmost enthusiasm. Despite not all of the group knowing each other very well before they came to Sri Lanka, the students seemed to quickly click as friends and they boosted each other’s’ confidence throughout the duration of the project, even in the face of challenges. Three key people must be mentioned as the driving force behind the group and they are the group leaders; Miss Cooper, Miss Halket and Mr Gonachon were ceaselessly encouraging and brilliant. It was a pleasure to work with this group and we’re looking forward to having them in Ghana next year!